Kantha is the most popular embroidery of West Bengal done with folk motifs. 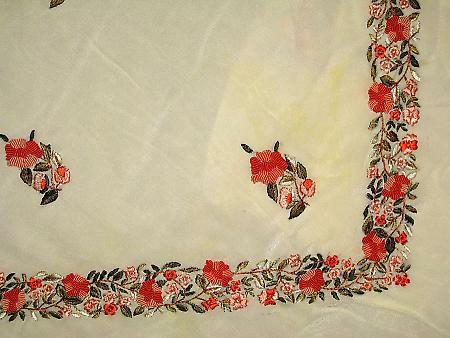 Other embroideries include the chikan work, the zari work and Kashida. The fine subtle form of chikan embroidery is usually done on very fine textured cloth like muslin and cotton. The embroidery is usually done by the same coloured thread as the cloth itself. Like blue thread is used on light blue cloth while white thread may be used on white cloth. Though white on white is a popular combination other colored threads are also used in white cloth. Silk embroidery on cotton clothes, the Kashida, is the most common form and is used primarily for caps and scarves used by the Muslims for prayers. More contemporary modern embroidery involves Kashmiri stitches, Cross stitches, Convent stitches, Cut work and combinations. Kathiawari mirror work is also used in abundance. The modern style uses alpana designs and motifs of flowers, animals and birds.